Come learn how spinning and weaving relate to math, science, and creative skill development. This session explores one of the oldest forms of technology, transforming plant and animal fibers into string and woven cloth. We will talk about how cultures around the world have used fiber for clothing, record-keeping, and communication, and do a bit of spinning and weaving ourselves. Anne Tiballi is the Director of Academic Engagement at the University of Pennsylvania Museum of Archaeology and Anthropology. Anne received her PhD in Andean archaeology from Binghamton University, and conducted her dissertation research at the Penn Museum. Her professional interests center on human interactions with technology, craft production and identity, and textile analysis. In her current role at the Penn Museum, she works collaboratively with museum staff and university faculty to devise novel and effective ways to incorporate the Museum’s collections into the curriculum. In the early 2000s, Iraqi designer, Yaroub Al-Obaidi, was building a promising career as a Fine Arts Lecturer at a University in Baghdad. He came from a well-educated family and lived a comfortable middle-class life, perhaps not so different from yours. Then in 2007, the threat of political violence reached his door and he had to flee his country. In this session, Yaroub will tell the story of his long journey traveling from Iraq, through Syria, to Kuala Lumpur, Malaysia, and finally Philadelphia. He will visit each point of his journey with his personal photos. Describing the memories, challenges and hopes he had at each transition. Yaroub will explain the contexts of global conflicts and refugee issues. Engaging dialogues around vivid photographs will encourage participants to think about the complex issues of international affairs in a very personal way. Why is color important to people? The technology of creating color has impacted and informed our culture for thousands of years. In this workshop we explore the evolution of different paint and dye making techniques from prehistoric peoples to the ancient Romans, some of which still manage to impress modern scientists today. By breaking down the basic components you need to create a workable paint, we will experiment with different kinds of materials found in the world around us. Can you make paint with grass or what’s leftover in your fridge? Our humanity compels us to try! The Penn Museum’s new Global Guides Program offers gallery tours led by immigrants and refugees. In addition to sharing historical information about the artifacts on display, the guides combine personal experiences and stories to interpret objects from their countries of origin. At this event, teachers will tour the Middle East Galleries with Global Guide Moumena Saradar, a professional medical interpreter in Arabic, working for several interpreting agencies in Philadelphia. She is originally from Syria. Her travels to several countries in Asia and Africa and her experiences viewing popular Egyptian monuments motivated her to share her cultural understanding as a Global Guide at the Penn Museum. ALL middle school* teachers in Philadelphia public and Title I charter schools are invited to preview the new components of Unpacking the Past. 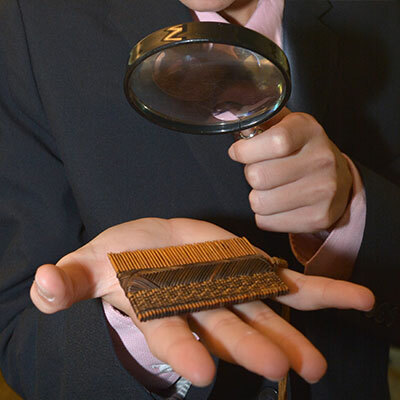 Unpacking the Past is a free program that provides middle school classrooms studying ancient civilizations with an outreach lesson in your classroom, a field trip to the Penn Museum (busing included), on-going teacher professional development, and much more! At this professional development, you will be among the first to preview the new Middle East Gallery workshop and tour that your students will experience on their FREE field trip to the Penn Museum next school year. You will also practice object-based teaching techniques in the galleries and learn from an expert in Middle Eastern history. Participants will receive six Act 48 credits. Breakfast and lunch will be provided. Many of the artifacts at the Penn Museum, like other museums in North America and around the world, were collected during times of overt colonialism. Museums today, including the Penn Museum, are grappling with the ways that they can acknowledge and disengage themselves from colonialist ideals. For our final Teacher Talk of the school year, please join us for a thoughtful discussion about the current movement to decolonize museums. 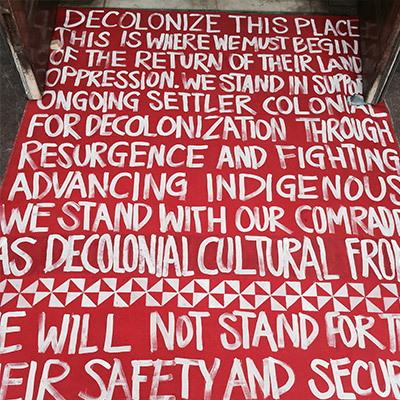 Thomas Leischner will facilitate a discussion, partially based on his master’s thesis paper on the topic, wherein we will examine the roots of the decolonization movement and how it relates to our teaching both in the museum and in schools. Teacher Talks are free for Philadelphia educators and participants receive refreshments and Act 48 Credits. Join the Penn Museum for an evening of discovery and inspiration in the brand new Middle East Galleries. See how this first phase of the Building Transformation Project will take you and your students on a journey, exploring how ancient Mesopotamian societies gave rise to the world’s first cities...cities not so different from our own. Enjoy beer, wine and Mediterranean hors d’oeuvres while you discover how these objects will lend themselves to your curriculum! Try out some of our newly developed activities inspired by this incredible collection of objects and chat with trained gallery guides who can answer your burning questions about the ancient Middle East. Please join us as Mary Mills and Rebecca White from AECOM Cultural Resources to discuss ongoing excavations along I-95 here in Philadelphia. They will bring a sampling of the 1.5 million artifacts recovered to date. Ranging from Native American points to infant feeders and roach traps, the artifacts reveal new details about daily life and early industries along the Delaware River. Having years of experience in museum education and public outreach, our speakers will share how educators can guide students in the use of material culture and primary documents to understand the past. Travel back in time to 1500 BCE to see ancient Egypt beyond the pyramids and mummies with Egyptologist Shelby Justl. Explore ancient Egyptian settlements and daily life, including the glamorous palaces of Pharaohs, to huge private officials’ villas, to small workmen’s dwellings. Learn more about the ancient Egyptians’ childhood, family life, occupations, leisure activities, and even what the clothing they wore and the food that they ate. Get answers to all your burning questions about how ancient Egyptians handled challenges like illness, grief, theft, lazy co-workers, and bad bosses. Co-sponsored by the Brown University’s Choices Program, Penn’s Middle East Center, and South Asia Center, this workshop will introduce educators to the Choices Program's award-winning resources to teaching about contested international issues. Participants will be immersed in two Choices units: The Middle East in Transition: Questions for U.S. Policy and Confronting Genocide: Never Again? as well as two Penn Museum exhibitions, Cultures in the Crossfire: Stories from Syria and Iraq, and Bearing Witness: 4 Days in West Kingston. Workshop includes two curriculum units ($80 value), lunch, certificate of attendance, Six Act 48 credits, and all workshop materials. The Penn Museum is famous for our collection of ancient archaeological material, but we also have several exhibits focused on contemporary people. This evening, we will spend time in two galleries that address modern events - Cultures in the Crossfire: Stories from Syria and Iraq, and Bearing Witness: Four Days in West Kingston. What did the curators want visitors to learn? How did they want us to feel about these contemporary people? How can we see their intentions in the design of the displays, text, and multimedia? How can we help our students make sense of these exhibits? This FREE opportunity features breakfast, parking, and Act 48 Credits for PA educators. Presented by the Penn Middle East Center and the Penn Museum. What is it like to leave the only place you’ve ever called home? Former refugee, turned human rights advocate Nyamal Biel Tutdeal will tell her story as a refugee, touch upon the current worldwide migration crisis, and highlight the importance of rallying as world citizens to understand the refugee experience. A reflective discussion will encourage teachers to think critically about the issues that refugees face upon arriving to their new home country. Sponsored by the Unpacking the Past program at the Penn Museum. Get an exclusive, behind the scenes tour of our vast archives with a focus on Penn’s excavations of Maya sites in Central America. Learn about the Maya culture and the people who study it. Teacher Talks are free for Philadelphia educators and participants receive dinner and Act 48 Credits. Hear from an expert from the field excavations in Abydos, Egypt. See pictures, ask questions and learn about the discovery of a previously unknown ancient pharaoh and ceremonial boat structure. The ancient city of Cahokia thrived from AD 1050 - 1300 and was home to over 20,000 people. We know these people built massive earthen mounds, however, the history of mound building begins nearly 5,000 years before the Cahokia mounds were constructed. In this workshop, we will examine the archaeological site of Cahokia and investigate the origins of America's first city. This interactive workshop will introduce educators to the Philadelphia World Heritage City Project, to the heritage education resources available at the Penn Museum and elsewhere right here in Philadelphia, and to the recent first international Philadelphia World Heritage Education trip. Participants will work in small groups to examine new global curricula across grade levels and disciplines, discover object-based learning techniques using Penn Museum galleries, and hear Philadelphia teachers discuss how they have implemented their visits to Indian and Nepalese World Heritage sites and cities into classroom action plans. Act 48 Professional Education credits are offered for this workshop. The Middle East Center and the Penn Museum invite you to join us for morning of learning on Thursday, August 24th. 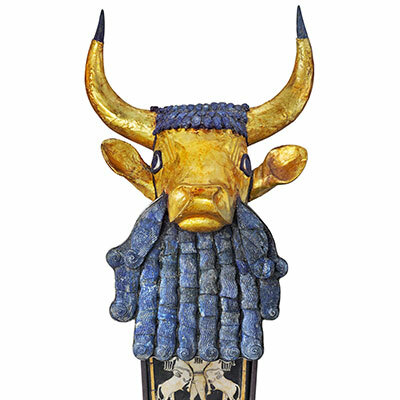 Participants will receive a tour of the new exhibit “Cultures in the Crossfire: Stories from Syria and Iraq” and a hands-on workshop that focuses on ancient Middle Eastern adornment. Before the tour, Dr. Lauren Ristvet, Dyson Associate Curator in the Near East Section, will speak about her experiences curating the exhibit. August 22, 2017 8:30 a.m. – 3:30 p.m.
Join us for a day of exploration of the Penn Museum's Artifact Loan Boxes. Participate in hands-on workshops that demonstrate how to use objects in your classroom – no matter what subject you teach! Learn directly from Penn Museum experts and preview examples of cross-curricular lessons that place objects at the center of learning. Breakfast and lunch are provided. Participants will receive Act 48 Credits. Join us for a two day exploration of the Penn Museum’s Artifact Loan Boxes. Participate in hands-on workshops that demonstrate how to use objects in your classroom – no matter what subject you teach! 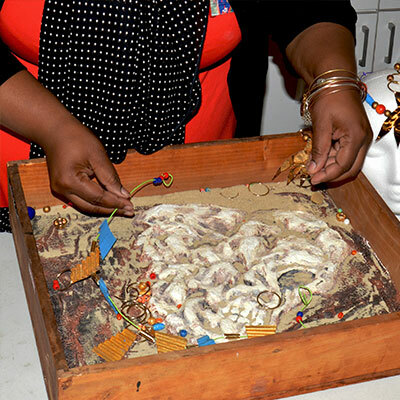 Learn directly from Penn Museum archaeologists and conservators and develop engaging cross-curricular lessons that place objects at the center of learning. Breakfast and lunch are provided both days. Participants will receive Act 48 Credits and teaching resources.